Transforming Interiors is a design firm based in Grand Rapids, Michigan. Transforming Interiors owner, Karen VanderWerp started her career in interior design over 40 years ago. Her appreciation of style at any budget has allowed her to work with homes of all sizes on both residential and commercial projects. Karen is also the owner and founder of K Linn, a custom furniture line specializing in high end reclaimed wood furnishings. K Linn's pieces are hand crafted, one of a kind and made in the USA. The furnishings incorporate superior craftsmanship, creativity and imagination in to the design process and furniture line, and they believe in re-purposing high quality reclaimed wood into fine furnishings for your home. Whether you are in need of a new accent piece or you are looking to style an entire room, K Linn and Transforming Interiors can help make the process seamless. They will come to your home for a consultation to create a design plan tailored to you with long or short term goals. We specialize in a range of styles and all of our services are structured to accommodate your design goals and your budget. Call today to set up your initial consultation! The Homestead Shop, Inc. specializes in helping our clients create beautiful interiors through a full line of custom products. We will help you get the look you have always wanted. All our products are custom-made; this means your tastes are reflected in the final products. Additionally, because our products are custom-made you have access to a wide array of fabrics and sizes. Window Fashion Design Professionals - we offer in-home consulting to select the best window treatments for your home and budget. From Simple to Extraordinary we can do it all - draperies, blinds, shades, cornices, shutters, motorization and more! And create the bedroom of your dreams with custom bedding, upholstered headboards, bed skirts, bench cushions and pillows from Gotcha Covered. Our fabrics range from sparkly sheers to upholstery grade plaids to embroidered cottons. Interested in home automation? Consider motorized shades with sun senors and solar packs. We include professional installation and after sales support. Brands: Comfortex, DSC, Graber, Hunter Douglas, Kathy Ireland, Lafayette, and Somfy. Fabrics from Fabricut, Lafayette, Norbar, Stout, Trend and Wesco. At Blind Ideas you will find more than great window coverings. Whether you are shopping for a single window treatment, redecorating your entire house or seeking the solution to a complex design challenge, you'll find great people who have the knowledge and expertise to help you put it all together. We proudly serve Grand Rapids, MI and the surrounding area. Since we're locally owned and operated, we take our long-term commitment to the community seriously, and we are proud of the professional products and services we provide. We are here now - and we'll be here in the future when you need us again. Call on us for your next design project! Window treatments of every design! We are a Hunter Douglas Gallery Showroom that has provided window coverings for residential and commercial settings since 1935. Offering shades & blinds of every description, including the latest in motorization, and fabric treatments and coordinating pillows and bedding. *Preferred Lafayette Interior Fashions Dealer* Since 1993, I have been working with both clients and designers in the Grand Rapids area, helping them to select and design “The Right Effect” for windows in their homes and businesses. I specialize in both soft window treatments, including draperies, drapery hardware, and cornice boards; as well as hard window treatments, such as blinds, shutters, roller shades, plantation shutters and more. I also design and produce custom cushions and pillows. As a full-service business, our small, dedicated team will design, measure, produce and install everything from start to finish. We believe that windows can be the finishing touch that ties a room together and are looking forward to working with you to create “The Right Effect” for your home! At C. E. Lee Decorating Center you will find more than great window coverings. Whether you are shopping for a single window treatment, redecorating your entire house or seeking the solution to a complex design challenge, you'll find great people who have the knowledge and expertise to help you put it all together. We proudly serve South Bend, IN and the surrounding area. Since we're locally owned and operated and in our 5th generation of ownership. We take our long-term commitment to the community seriously, and we are proud of the professional products and services we provide. We are here now - and we'll be here in the future when you need us again. Call on us for your next design project! Budget Blinds, Inc. is the #1 Custom Window Covering Company in the Country, with over 900 Franchises in the US & Canada. We introduced Budget Blinds of Hudsonville to the West Michigan Area in 2002, specializing in Residential & Commercial, custom-made, window treatments. We offer everything from blinds, plantation shutters, shades, draperies & drapery hardware, to decorative interiors, such as designer throw pillows & bedding, headboards, fabric window toppers, and more! Through our Budget Blinds Commercial Solutions Division (aka: "BBCS"), we have worked with schools, churches and other non-profit organizations, hospitals, medical centers, banks, restaurants, cafe’s, salons, and more. We provide free "Business Design Consultations" and understand that privacy, security, aesthetics, functionality, safety, longevity and affordability are all critical needs for a business owner when selecting window coverings. We make sure these aspects are met with simplicity, so if you're looking for a "Footprint that meets the demands of your Commercial Blueprint", we are the right partner for you! If it's your own home that needs a window treatment face lift, we offer free "In-Home Design Consultations" through our Budget Blinds & Inspired Drapes divisions. At Budget Blinds, we bring the store to your door & will help you design attractive window treatments that are sure to impress any guest in your home! Beginning with our FREE In-Home Consultation, & lasting long after we have completed the installation of your new window treatments, we make your window treatment shopping experience fun, professional and simple! 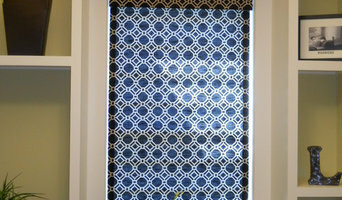 For more information and examples of the products we provide, please check out our full-color design guide at: <a rel="nofollow" target="_blank" href="http://www.budgetblinds.com/Hudsonville/">http://www.budgetblinds.com/Hudsonville/</a> We are available by phone, M-F from 8AM to 5PM, and available for Design Consultations by appointment only from 9AM-6PM, Monday-Friday; some evenings and Saturdays available. Please call 614.669.7898 TODAY to schedule your FREE Design Consultation! Thanks so much for your interest in Budget Blinds of Hudsonville and East Grand Rapids! We look forward to working with you! We would love to help with your project! 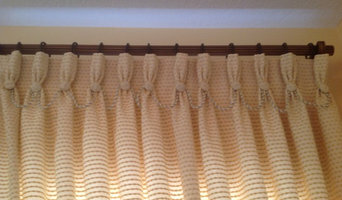 We can do custom draperies for your home, or alter/remake what you have for a new look. In the workroom we can do anything from shorten your store bought panels – add a contrasting color band, to creating a whole new look/window treatment. We can use your fabric or find new fabric through one of our resources or vendors. We have access to lots of fabrics through different design houses. (Ado, Fabricut, Lady Ann, Robert Allen...) or from an online site. We do Spring Crest drapes and Springcrest cleaning, custom bedding & nursery sets, slipcovers & light upholstery. If you give us measurements, we can make any of the above custom products and ship them to you, along with hardware necessary. 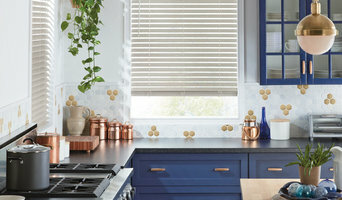 We also sell a verity of blinds - Hunter Douglas, Graber and others.